Ever thought about having a farm? Precisely, raising goat farm for business? As we all know, almost every part of goats is usable for humans. Their milk is tasty and healthy, their meat is delicious, their fur is warm and soft, even their feces could be used as manure. Not a fan of those products? Well, we can pet them for a lovely company, too! Before we continue, you might want to check what to prepare to start your own farm first. Or keep reading this if you want to know what are the benefits of raising goat farm business. You know, for consideration. Compared to cows, goats are cheaper and smaller so they are more affordable to purchase. The smaller size means that your goats need a smaller place—which usually cheaper—to live comfortably. Start with a small number of goats. With proper care and management, your goats won’t get sick and your business could grow fast within one year or two. Your does (female goats) can labor more than once in a year. They reach sexual maturity within their 7-12 months of age and give birth within a short time. Some goats even produce more than one kids per labor. That way, even if you start with two goats, the number will soon multiply. What a nice investment, isn’t it? Because of their fast-growing, goats also reach their slaughter age faster. With their ability to multiply and mature faster than other livestock, goat farming takes a shorter time to make a profit. So what are we waiting for to start? Goats don’t need a high-end housing system. You can even keep them in your backyard if you have enough area, of course. Small farmers might share goats’ shelter with other livestock and it still works well. They are very suitable for mixed farming with other domectic animals. Even though goats are able to adapt in almost all types of agroclimatic environments or conditions, do make sure their shelter can protect them from heat, wind, rain, and snow. As long as you can keep their shelter dry and clean, your goats could live happily and healthily. Due to their low maintenance, we can’t start goat farm with a minimum number of worker, you and your own family, and ta-da! lower cost labor it is. Again, compared to other livestock and ruminants, goats eat almost all kind of grass including weeds. They don’t need grain very much, though it would be a nice treat for your goats. But you have to pay more attention to what your goats are eating on the rainy season. In this season, the risk of some diseases attacking our beloved goats is getting higher. Unlike any other livestock, there is no religious taboo in consuming goats milk and meat. Everyone can enjoy the delicacy of goats, well, unless you are vegan of course. Hence, one of the benefits of raising goat farm business is there is always a demand for your business. Goats meat is high on protein and calories compared to other livestock. Though it also has high-fat concentration, it’s still lower than pigs. Just make sure to have a balanced diet to enjoy goats meat with no worry. One of the breed that is known for highly meat production is boer goats. Goats milk is easier to digest compared cows milk. Though we won’t suggest you who’s lactose intolerant to convert to goats milk; the chance that you might be allergic to goats milk also high. But it is indeed lower in lactose and has smaller fat globules, making it easier to digest. Goats milk is recommended by some researcher to be consumed by individuals with malabsorption issues, anemia, osteoporosis or prolonged treatments with iron supplements. But always remember to only use pasteurized milk to avoid any diseases that could be transmitted from goats. Now, have you ever heard of soap or lotion made from goats milk? That is because goat milk is good for our skin! The fatty acids and triglycerides in goats milk not only keep our insides running smoothly, but also help us look great on the outside, too. Goats milk has high levels of vitamin A that improve our skin complexion, fight acne and improve overall skin health. Moreover, the lactic acid found in goats milk helps us to get rid of dead skin cells and increase skin smoothness and thickness. So if you breed dairy goats for business—like Nubians, Lamanchas, Alper, Oberhasli, Saanen and Togenburgsnote—note that their milk not only consumable for foods, but also cosmetics. Now we are aware of their meat and milk advantages, but that’s not all. Some breeds like cashmere goats are known for their wool production. Other breeds like mountain goats are blunt, square looking covered with soft white, woolly, dense undercoat. Not only their fur, we also can use goats feces as a high quality natural fertilizer in crop field. This will directly help to maximize crop production near your farm, also profitable to sold as manure. Like killing two birds with one stone, right? 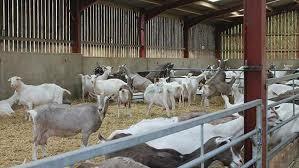 With all other benefits mentioned above, we can say that goat farming have good returns of investment ratio. That is according to the fact that for investment per unit, they produce more than other livestock. Are you already considering to have goats farm after knowing all those benefits of raising goat farm business? We just hope that you don’t take the easiness of raising goats for granted. Make sure to not only taking things, but also giving. Treat them well, for all thing we could take from them. And we wish tons of luck for your farm!